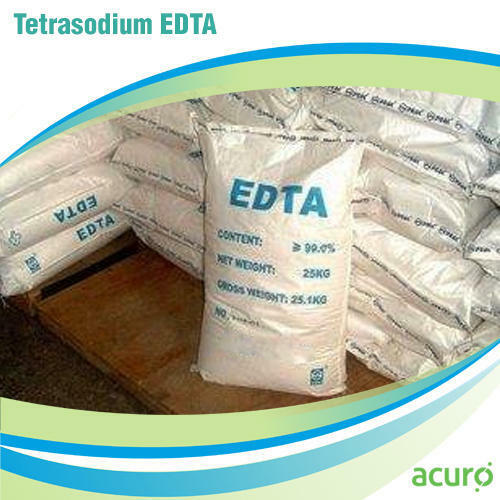 EDTA, Tetrasodium Tetrahydrate Salt is a chelating agent with wide ranging ability to sequester various polyvalent cations. Used in experiments as a simple model for amino acid components of proteins. EDTA (Ethylenediaminetetraacetic acid) is a chelating agent, a general chemical, and a sequestrant. EDTA is used extensively as chelator of divalent cations such as Ca2+. Used to minimize metal ion contaminants. Also used to facilitate enzymatic reactions that could be inhibited by heavy metal traces. Inhibits enzymes, such as metalloproteases, that require divalent cations for activity.